Chakra means wheel in Sanskrit. Chakras are energy centers in the body running along our central energetic channel, Sushumna Nadi. Awakening the chakras corresponds with increased consciousness and awareness. As we move up the chakras, we move from perceiving the world from a place of survival towards experiencing oneness, bliss and enlightenment. The Chakras are created when the right channel of energy, Pingala, our masculine, sun channel, and the left channel, Ida, our feminine, moon channel cross each us other as they wrap around the central channel. 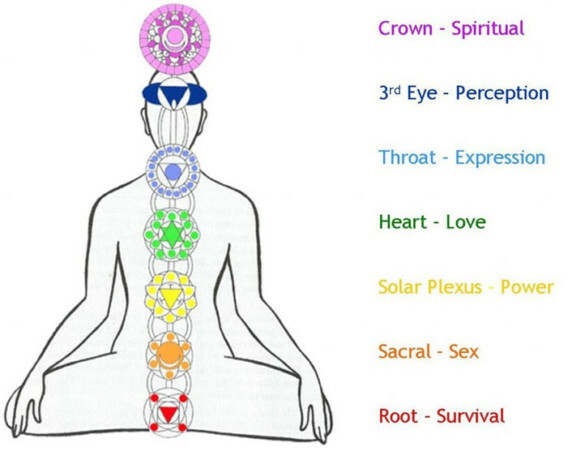 There are 7 chakras, running from the base of the spine to crown of the head. This first chakra is located at the very base of the spine. It is associated with our most mundane, base concerns: our home life, relationship to our parents and financial security. When it is open, we are grounded, secure and stable. It is represented by a red, 4-petaled lotus flower and the earth element. Located 3 inches below the belly button, between the hips, is th e Swadisthana Chakra. It is the seat of the water element in our bodies and represented by a 6 petaled orange lotus. It is related to our sexual organs and our creative and business relationships. When this chakra is open, our emotions are in balance. Behind the navel at the very center of the body is the 3rd chakra, the seat of our will, drive and ego. Manipura chakra is represented as 10 petaled yellow lotus flower and the element fire. Although moving towards the more subtle, we still view the world as place of sensual pleasure in this chakra and we still cling to material ambition and social recognition. In the the center of the chest is the Anahata Chakra, the seat of compassion, kindness and love in the subtle body. We have moved from the heaviest element, earth at the base of the spine, to the more subtle element, air. This chakra is blue lotus with 12 petals. When we open this chakra, we see the world through the veil of compassion. Located in the throat and concerned with where we speak our truth and express ourselves is the Vishuddi Chakra. Represented by the 16 petaled blue lotus and the element ether, when this chakra is open, we are mentally balanced and sensitive to the needs of others and established in truth. Move to the 3rd eye center, located at the top of the spinal column in the medula oblongata, is the Ajna Chakra, the seat of our intuition. When this chakra is open, we never second guess ourselves and we are secure on our path and within our energetic body. We are able to perceive the subtle, energetic world as well as the gross, physical world. This chakra is represented by a 2 petaled violet lotus and the element space. Located at the crown of the head, Sahasrara Chakra is our connection to the source and to all other living beings. A thousand petaled lotus of pure white light and the sweetest and most subtle of the elements, acacia, represent this chakra. When this chakra is open, we experience union and oneness and we are liberated from separation. If you want to feel your subtle, energetic body, study it! Then give yourself the time and space to be still and experience the flow of energy within. Close your eyes, regulate your breathing and imagine each chakra as you move your awareness from the base of your spine to the crown of your head. Reflect on how you can bring more balance to the relationships at each chakra and take note of where you can refine your behavior. Now go shift your perspective and elevate how you see you the world! Share the post "Mantra of the Week: Chakras – Mapping the Subtle Body"
do not wish to see some type of harm befalling on them. One that doesn’t allow you to die completely.” Die? As she moved to climb up the beasts fell over, crashing through the railing.